Moss Hart & Kitty Carlisle Hart New Play Initiative! and host Dr. Catherine Hart. The GTC New Play Initiative has expanded to become a national program called the Moss Hart and Kitty Carlisle Hart New Play Initiative. Click here to go to the HartNPI.org website including information on the Hart NPI’s first cycle of plays. Below is some information on two of our past GTC NPI projects. Eternal Equinox was an NPI Production winner which went on to an Off-Broadway run at The 59E59 Theaters. Bobby & Matt: Passing Notes Through Life was an NPI Special Event and was produced in NY at The Players Theatre. Eternal Equinox, a GTC New Play Initiative show by Joyce Sachs opened to great reviews Off-Broadway at the prestigious 59E59 Theaters. 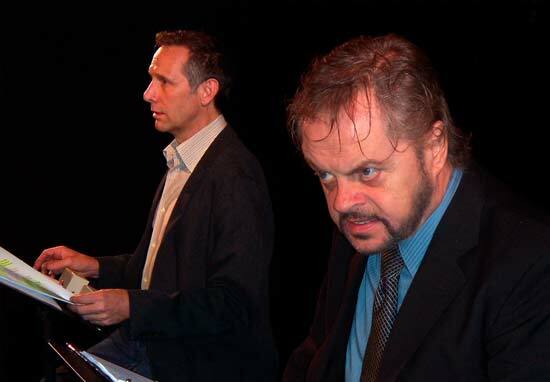 “Bobby & Matt, Passing Notes Through Life” premiered at GTC Burbank as a Special Event of the New Play Initiative and then had a very successful run at The Players Theater in NYC as part of the New York International Fringe Festival. Bobby & Matt was a Critics Pick at BroadwayStars.com and named one of the “Ten Most Promising FringeNYC plays” Chelsea Now, The Villager and Gay City and a “Hot Queer Pick” by Edge New York and Edge Fire Island. (pictured above are Stephen Hope and Gary Marachek).